Welcome to our summer theater interns, who have come from far and wide to work with us on our theater camps and productions! 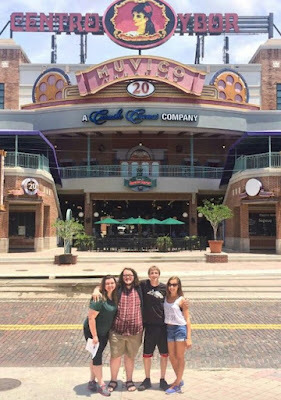 Patel Conservatory theater faculty recently attended the Southeastern Theatre Conference in Chattanooga , Tenn. and interviewed more than 40 candidates for our summer internship program. Candidates had extensive experience in their schools and community theaters in various aspects of theater, from technical theater to costuming. Four were chosen to work with us on our summer camps and productions including Aladdin Jr., Shrek the Musical and Showstoppers. “Making the jump into an organization the size of Patel Conservatory was a bit daunting for me as I come from a much smaller program. But when I approached the beautiful campus, my mind was immediately put at ease knowing that I would be working in paradise. The true beauty, though, lies with the staff of the Conservatory. They welcomed us immediately with warm greetings and gracious accommodations. It has made me really look forward to this summer. Orientation has been amazing thus far and I have already learned so much. Throughout my career, I have had the pleasure to work with a variety of talented young artists and I cannot wait to continue that here at the Conservatory. “The first thing I noticed when I got here was the beauty of the Patel Conservatory campus and the state-of-the-art facilities. The week started with preparation for this summer’s fun activities. This included our participation in the new Apprentice Boot Camp. It was a weekend program that introduced the apprentices to the basics of all of aspects of theater. It was a great experience, even for someone who is in college. I’ve worked with the American Shakespeare Center and The Russian National Ballet, and I already know that the knowledge gained from this summer will be equal or greater. I hope to offer students new insight into character development and stage management. “Week one at the Patel Conservatory was a flashback to my childhood summer theater camp days. We've met lots of exciting and talented people, played games and explored the city. The Conservatory staff are fun, generous and caring, and the students are thriving. Watching auditions and callbacks as well as attending the Apprentice Boot Camp was an exciting glimpse into the influence of this conservatory. “The Patel Conservatory summer internship program has already been an eye-opening experience. Though I have only been here for a short time, I feel totally immersed in the program, which stems from the rare balance of excellence and caring. The directors and staff are so knowledgeable that you automatically feel challenged and ready to try new things. A sort of Jack-of-all-trades, I've had extensive experience in directing, acting, singing, stage management and design. I’m ready to bring and hone these skills during my very first internship.